This occasional series has often drawn upon the work of Phil Cashen of the Shire at War blog, about how the Great War affected the Shire of Alberton, around Yarram in South Gippsland, Victoria. We saw Shire at War look at schooling, drinking and – more than once – recruitment for the Australian Imperial Force. Recently, the blog looked again at schooling and at a now disused social occasion, the Smoke Social. This piece first explores the dissension around the opening of a new Catholic primary school in Yarram and the raising of funds for it. [T]he greatest difficulty experienced [said Catholic Bishop Phelan in April 1918 of what had happened during the war to that point] was the wall of prejudice raised by narrow-minded people who endeavored to howl down every movement for raising funds except for Red Cross or Imperial purposes. But the stirling Catholics of Gippsland, like their fighting brothers at the front, did their duty towards all the demands of the Empire, and broke through every barrier that prejudice and bigotry would raise between them and their own field of labour. 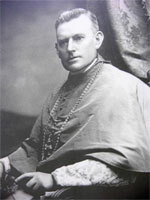 Bishop Phelan’s unrelenting focus on Catholic education [which] during WW1 served to heighten division within the broader community. Effectively, he forced the Catholic community in Gippsland as a whole, and not just in the Shire of Alberton, to assert their separate identity and status through education. And that, in turn, wound back to questions about the loyalty of Irish Australians to the war effort. While Catholic ‘opposition to conscription is routinely presented as the distinctive behaviour of the Catholic minority in WW1, it is clear that considerably more than this single issue was at play’. It is clear that the picture to emerge that night was not an overly positive one. Repatriation – and in particular the call to settle returned men on the land – was certainly both an ideal and an urgent priority – in the community and at every level of government – and there was, apparently, universal commitment to it. However, the lines of division, the political infighting, the threats of recrimination were all coming into focus. Repatriation, as a moral ideal, was about to be hammered into shape as a political compromise. The true worth of the heroes of Anzac had to be tested in the real world. As future posts will show, the situation was going to become ugly and in one of the greatest ironies, where all the advice that night was for the men to stick together and become their own political masters, in the end when the soldier settlement scheme finally became established in the Shire, it would be the “old guard” – the local councillors, existing landholders and other established vested interests – who would have the real power. The heroes would have their repatriation, but only on the terms set by their betters: the generation of Imperial Loyalists who had waved them off.